I am willing to share my insights and experience with you by phone if you wish (Cell: 213-700-0080). I am a homeowner with more experience than I wish I had in the reconstruction of a leaking roof-deck, having done this job just eight years before. The experience I had with another contractor frustrated me and his outcome failed me. Not so this time with Darren of SoCal Decking. My house is built on a slight hill. The roof of a three car garage is a large front deck. It has stairs up to it from the sidewalk, a standard entry door to the living room, and a sliding patio door to the dining room. The deck is why we bought this house in 1989. It is a wonderful feature, and also a leaking curse! When I bought this house, the seller mentioned there was a “small leak” through the deck into the garage. We put up with covering the deck in plastic for the winter rainy season for many years. It was tedious and only reduced the leaking... not a solution. Eight years ago I paid a different general contractor to remove the flagstone deck cover and “fix it’ so it would ‘never leak again.” He moped tar paper covered plywood flooring with hot tar, poured cement on that and then put new flagstone on it for a finished look. It began to leak almost to the day when the five year warranty expired. We again suffered through spreading plastic for a few years, then bit the bullet to have it done over by someone different, someone competent about waterproof decking! This time I really researched the technology of deck waterproofing and the typical sources of leaks. I wanted someone who specialized in deck waterproofing, and who would impress me with his flexibility and professional interaction. After interviewing several firms for the job, I picked Darren Elliott of Southern California Decking. I really needed him to provide a solution to my worst annoyance in owning an otherwise beautiful home. Darren did not disappoint me. In fact, he surprised me with his excellence in handling a fast changing job, and treating me fairly. I initially intended only to replace the deck cover as I did eight years ago with the prior, incompetent general contractor. Darren explained to me the likely sources of leaks, one being through the stucco wall, another through a glass brick window and another through the bases of my ancient, rusting deck railing. The job quickly began to expand in complexity and time. At my request, I had Darren's crew knock off the stucco around the deck and stairs. We found the waterproofing membrane... 60 year old tar paper, had simply disintegrated from age! It should have been no surprise, but my prior contractor never thought to check that. Darren then referred to me an outstanding railing (iron welder) contractor who I love for his quality, price and timely completion. He replaced the old railings that were too short for today's building codes anyway. We found the prior contractor had done poor work in bolting the old railing to the deck, causing them to wobble and create a source of leaking. When adding work by change-order to a contract, you want to be dealing with a contractor who has integrity. If not, then you're open to being squeezed. 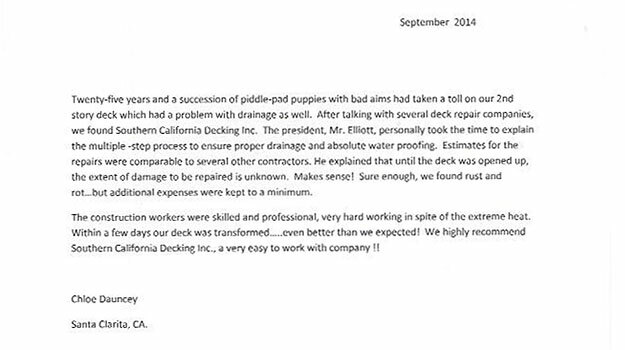 The additional work that became needed after starting the contract was critical to making the deck waterproof. I had them remove old stucco and replace the tar paper in the exterior wall, then hire a stucco contractor to match the stucco of the house. Like the railing replacement, that stucco job was priced very reasonably and done quickly and perfectly. I was so impressed, that I decided to make additional change-orders to suite my tastes. I had SoCal Decking change a sliding patio door and a front entry door to the house. I first sought bids from three other door specialty contractors. They wanted more money and required six weeks to deliver a sliding patio door... time I didn't have. The door needed flashing to be seamless with the deck. Darren obtained a high quality door in two weeks and installed it as the deck replacement progressed. He also constructed a through the wall doggie door at my direction. I then had Darren hire a framer to construct a decorative pergola on the deck, and later one above the garage door. These pergolas look beautiful! My house looks distinctive to passers-by and gets lots of positive comments from neighbors! Darren recommended that I remove old stone and stucco along the outside wall facing the street. He warned me to expect dry rot on the old framing. We found the inevitable dry rot from decades of water leaking. The stairs had to be completely demolished and rebuilt. The garage” header,” which is a heavy beam over the garage doors, had to be replaced. I hired the framer who Darren had construct the pergolas to replace the garage header and support posts. He quickly did the formidable task of removing the old header and replacing it with a new one. Darren also recommend knocking out the plaster inside the garage on the ceiling. I was glad to so, since it had holes from water damage and needed replacing anyway. Darren wanted to inspect the key support beam and joists supporting the deck. Fortunately they were fine. No dry rot or mold. The only water damage was on the front header at the garage doors, and in the framing of the outside stairs to the deck. Darren deck crew was capable and quick to demolish the old stairs and rebuild new ones. Darren then found me a dry wall contractor to replace the inside garage ceiling and sections of wall that we had demolished due to water damage. The new dry wall was done in an excellent manner. My garage, now cleared of junk and freshly painted, is any man's dream-come-true! I ended up spending what was a lot of money for me, about twice what I thought I would when I first hired Darren. That is not a complaint! It is the highest compliment. Every aspect of my expanding the scope of work was money well spent... either necessary due to water damage and age deterioration, or desired for the features that now make my enjoyment of this deck far greater than it ever use to be. Each decision to expand the scope of work in the middle of a deck retrofit job left me open to woes and high cost change orders. I was quite impressed that because of the skills, diligence and integrity of Darren Elliott and his deck crew, this job went fast and was priced in a very reasonable manner. No woes! Just satisfaction! That is not a common retrospective when a job starts simple and expands to become quite complicated. There are other details I can describe by phone than I will not go into here. Darren Elliott's leak prevention solutions are top quality... his professional insights far exceed the typical general contractor. I was awe struck by Darren's cooperative attitude and superior insights compared to the prior general contractor I hired eight years earlier to do the same job... awe struck and very grateful! Darren also offered creative ideas that I can only call inspiration to fulfill several of my special needs, such as fitting a tall boat into my garage. The end result is a new outdoor living space that I love, and a Super Bat Cave garage that lets my trailer boat stay at home instead of costly storage. Although the final cost was more than my starting budget, it is exactly what I wanted and Darren kept it affordable for me to do it all. The quality and conveniences he has added will in the long term, save me money while adding to my enjoyment of this old house. *Jake, Now that work has begun, I have a better idea of the scope of the work, plus the way your crew is approaching it.